A-HOTEL.com - Amsterdam luxury and cheap Apartments. Short and long apartment rentals. Amsterdam apartments offer a convenient alternative to hotels. Traveling with a family or group of friends? Rental accommodation in private apartments offer more space, privacy and often even cooking facilities and all that at more favourable price. You can chose large or small, luxurious or cheap apartment in Amsterdam. After entering the dates of your stay you will see available Amsterdam apartments and their precise prices in a given dates. With filters you can narrow or refine the offer of available offers and find for your stay the best apartment in Amsterdam. The Yays - Crane Apartment features a three-storey luxury apartment with panoramic view over the IJ river. It offers free WiFi and is located 2. Set in Amsterdam, Kwakersplein Apartments has well-equipped accommodation featuring free WiFi, 1.4 km from Anne Frank House and 1. De Pijp Boutique Apartments offers self-catering apartments located in the Pijp area in Amsterdam. Free Wi-Fi access is available. Nicolaas Amsterdam apartment is situated in Amsterdam. The accommodation is 1. Just 700 metres from Vondelpark and 1.5 km from Van Gogh Museum and featuring free WiFi, Trendy Canal Studio offers accommodation in Amsterdam. Set in Amsterdam, NDSM Serviced Apartments is 2.2 km from Regardz Zilveren Toren Amsterdam. Wittenberg is a monumental short stay building, offering modern accommodation in Amsterdam's residential area. It features a Smart HD TV. Penthouse Canal by Harbour Suites is located in Amsterdam, 500 metres from Anne Frank House, 500 metres from Royal Palace Amsterdam, as well as 1.3 km from Flower Market. These non-smoking apartments are located in an historic building in Amsterdam, just over a 10-minute walk from Amsterdam Central Railway Station. Each of the apartments and studios at Teatro includes free Wi-Fi. Yays Bickersgracht Concierged Boutique Apartments offers self-catering accommodations with free WiFi access located in a historical part just outside the city centre of Amsterdam. It offers a shared promenade on the canal side. Harbour Suites is situated in a historic building in the heart of the Amsterdam. The mansion was built in 1665, right on the old harbour. Located in Amsterdam, 100 metres from Museum Ons' Lieve Heer op Solder and 200 metres from Basilica of St. Nicholas, Canal side Olofssteeg provides accommodation with amenities such as free WiFi and a flat-screen TV. Set in the Amsterdam City Centre of Amsterdam, within 1.1 km of Anne Frank House and 1. 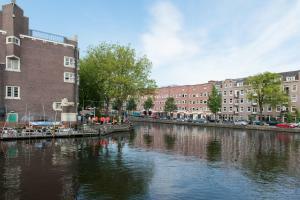 Offering views of river, Herengracht Canal Apartment is located in the centre of Amsterdam, 1 km from Rembrandtplein. Free WiFi is available in this apartment, set 1. Dapper Market Apartment Suites offers modern apartments with modern kitchen facilities and a living room with flat-screen cable TV and free Wi-Fi. It is around the corner from the Artis Zoo and Oosterpark.